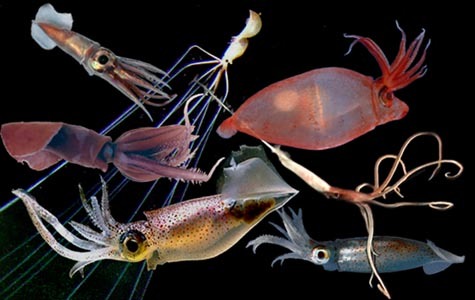 Among cephalopods, oegopsid squids dominate the pelagic, oceanic environment. Diversity at the family and generic levels is very high with 24 families and 69 genera. Although pelagic, some species are consistently associated with and some occasionally sit on the ocean floor. 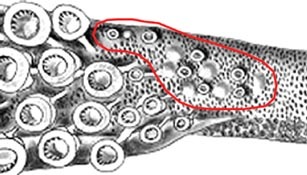 Tentacular club usually with carpal (= proximal) locking-apparatus. Figure. Oral view of the club base of Cycloteuthis serventyi. The red line encircles the suckers and knobs of the carpal locking-apparatus. Drawing modified from Young and Roper (1969). Suckers without circularis muscles (see Sepioidea page). Eyes without corneal membranes covering lenses. Figure. Dorsal view of the head of Pyroteuthis addolux with the protruding eye lenses directly exposed to sea water. Photograph by R. Young. Mantle locking-apparatus, with rare exceptions, reaches anterior mantle margin. Fins usually joined posteriorly and usually without posterior lobes. Figure. 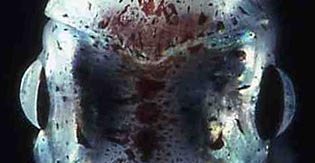 Ventral view of mantle and fins of Ancistroteuthis lichtensteini, 175 mm ML, Mar-Eco cruise, R/V G. O. SARS, North Atlantic. Photograph by R. Young. Figure. 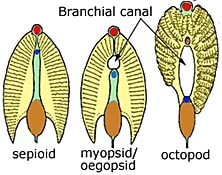 Diagramatic cross-section through gills. Drawing modified from Naef (1921-23). Females without accessory nidamental glands. Eggs, where known, in pelagic egg masses or egg strings. J. portieri photograph by Frank Parish; Magnapinna (?) photograph from N.U.R.C., others photographed by R. Young. Page: Tree of Life Oegopsida Orbigny, 1845. Authored by Richard E. Young and Michael Vecchione. The TEXT of this page is licensed under the Creative Commons Attribution-NonCommercial License - Version 3.0. Note that images and other media featured on this page are each governed by their own license, and they may or may not be available for reuse. Click on an image or a media link to access the media data window, which provides the relevant licensing information. For the general terms and conditions of ToL material reuse and redistribution, please see the Tree of Life Copyright Policies.